The Tuesday Competition reached its conclusion after a week of catch up. Nomads (Gareth Coates, Scott Haynes, Keith Hatzer and Philip Holroyd) needed eight points to wrap up another title as they faced Clayton (Tommy Harney, Tony Riley, Bev Shutt and Hedley Kettlewell) although lying third, needed points to avoid relegation, so close was the table. Holroyd collected four points as he went down 19-21 to Riley who took the five points. Hatzer claimed all five points as Harney took four in another 21-19 game. Coates was always behind from four across in his game with Kettlewell and from 11-14 Kettlewell made a break of six to reach all but from where the wheels fell off. Coates crafting a break under pressure of ten to run out, claiming the game by the closest of margins. In the final game Haynes went behind to a pair at the first end in his game with Shutt but he levelled at the second end and was never behind again, going on to win 21-6. Nomads 19 Clayton 14. Spen Victoria (Brian Thompson, Gerald Bromley, Les Mitchell and Barry Firth), already relegated, battled hard against Sowerby West End (Lorraine Hirst, Simon Leeming, John Sharp and Baz Morgan) eventually going down 16-17. There were wins for Mitchell and Firth, Hirst and Leeming replying for Sowerby. Elland and Rastrick Mixtures (Dave Pollard, Trevor Heley, Viv Smith and Roger Stopford) needed to put one over Hanging Heaton (Ian Smith, Steve Pinfield, Dean Scarth and John Watson) to give them a sporting chance of staying. Heaton taking all twenty points were now looking at the runners up berth, Heley was best for Mixtures with eighteen. Crosshills (Kevin Burnett, Ken Brenkley, Barry Turnbull and John Parkin) were seven in front of Hanging Heaton at the start of the day so needed to match their twenty as they lined up against Cleckheaton Sports (Richard Bentley, Paul Fincher, John Ineson and Dave Marshall). Crosshills only managed one win, by Captain Brenkley, in their 12-17 defeat and their chance looked to have gone. There were two extra games being played this week to catch up weather postponements so Sowerby West End watched on nervously to see if they could hang on to second spot where they currently sat. Crosshills (Kevin Burnett, Ken Brenkley, Barry Turnbull and John Parkin) started badly against Hanging Heaton (Ian Smith, Steve Pinfield, Dean Scarth and John Watson) who appeared to be thriving on the pressure. Scarth and Smith giving Heaton a 10-3 buffer as the second pair went on. Pinfield brought Turnbull off to single figures and Watson counted three points with his eighteen against Brenkley, the only winner for Crosshills. 18-9 the final score, and second place for Hanging Heaton. Mixtures (Rod Greenwood, Trevor Heley, Viv Smith and Roger Stopford) were fourteen points behind Cleckheaton Sports (Richard Bentley, Paul Fincher, John Ineson and Dave Marshall) as they went on for the final match which would decide the second relegation place, it looked a big ask for the Mixtures. Heley brought Bentley off to single figures – 5-1, Greenwood had a 21-11 victory over Marshall – 10-3. Was the great escape on? Stopford got the better of Ineson 21-16, which made it 15-6. Fincher steadied the ship for Sports with a 21-16 victory over Smith and a good win for Mixtures 18-11 but it wasn’t enough to avoid the drop. In the Plate Greetland (Mick Shaw, Pete Lea, Ken Fleming and George Simpson) finally secured their return to the Shield with a 20-5 victory over Asa Briggs (Don Harrison, Graham Pearson, Trevor Kendall and Ken McCafferty). Lindley B C (Geoff Price, John Allen, Robert Taylor and Mick Thornton) kept their hopes of second spot alive as they overcame Rastrick (Donald Booth, Paul Lowry, Doug Hewat and Terry Leach) 20-12, Rastrick hoping their twelve would be enough to avoid the wooden spoon. Bronte’s (David Hemsley, Martyn Benson, Derek Pollard and Tony Harris) went on against Cleckheaton Sports (Kath Icke, Janet Inness, Joyce Ellis and David Griffiths) knowing they needed fifteen points to secure second place and Cleckheaton knowing they needed thirteen points to avoid the wooden spoon. A full house for Bronte’s secured their return to the Shield, Griffiths with 20 was best for Sports as they counted nine points which would leave them at the bottom. 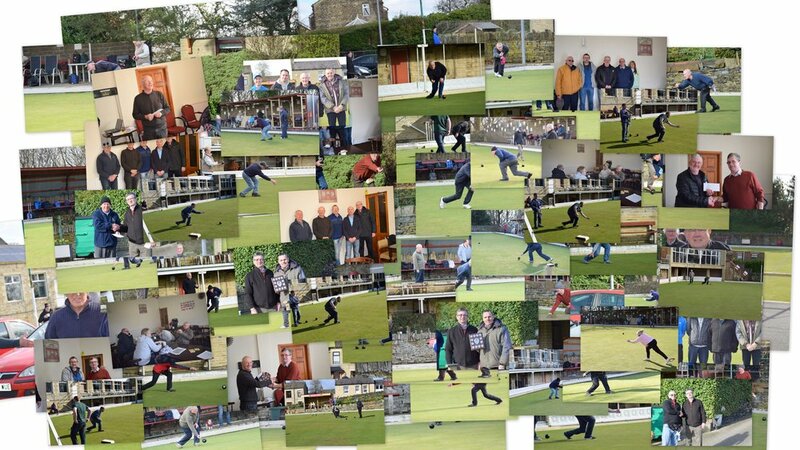 Pellon (Alan Moore, Paul Firth, Peter Steele and David Agnew) played the closest game of the day against Silsden (David Beardsworth, Lee Hicks, Derek Metcalfe and Peter Bailey). With two winners each the final score was 16-15.